On January 25th, we launched our (very first) #SSCAsktheExpert Twitter hour! We kicked off our new social media venture by having a live chat with our wonderful partners Muckle LLP. We collected some of our most frequently asked legal questions and invited our online community to chip in with any questions that they had as we went along. Just in case you missed it, we’ve collected the questions and answers and put them together in this handy blog post – so grab a cuppa and have a read! Questions were prepared by the Software City team (@SunSoftCity), and Muckle Associate and tech law hero Jill Dovey (@TechLawyerJill) provided the answers. Q1. What is IP (Intellectual Property) and why is it important? A1. Intellectual Property (IP) is an intangible asset that someone creates and includes copyright and trade marks. IP is important as ownership enables a person or company to earn recognition and/or financial benefit from what they invent or create. There is copyright in source code and anything you might write. Your business name and branding are trade marks. You can find out more about Muckle's IP services here. Q2. Why can’t I copy Term’s & Conditions from other websites? A2. Terms and conditions will be copyrighted meaning they belong to the author and you cannot copy them unless you have permission. Practically, the terms may have been tailored for a particular business (e.g. written for a specific territory) therefore you should not copy another business’s terms as it may not be suitable for your business. Q3. What’s the worst that can happen by copying Terms & Conditions? What are the most common implications of copying another’s T’s & C’s? A3. Your terms and conditions are crucial. They are what you can rely on if someone doesn’t pay you, to protect your IP and limit your liability. While we appreciate the financial pressure [on cash strapped startups], this is one area we would always suggest you get a lawyer to help you with. There are different ways this can be done and it doesn’t have to lead to a huge legal bill. Q4. Why should I set up as a Company? A4. In an unincorporated business your personal liability for the debts of the business are unlimited, meaning your personal assets are at risk. Whereas (in absence of fraud) as a company your liability is limited to the amount you paid for your shares. Q5. Would that be right from the beginning of a business journey? Or is there a point at which this should be incorporated? A5. It’s all a question of risk. You can incorporate into a limited company at any time. It can be simpler doing it at the beginning but if you are up and running it’s not too late to change your business structure. People often start and see how their business idea develops before paying the fees to set up a company. Muckle's corporate team can help you assess your options, click here for more info or email us for more advice. Q6. What about confidentiality? When should I use a confidentiality agreement? A6. Confidentiality agreements should be used when disclosing confidential information to any third party (employees, consultants, another business etc.) to help prevent information reaching a competitor or the public. Q7. We're often asked about what happens when businesses offer equity in return for development? What would be the implications/process for this? A7. If you have multiple products/services it might be simpler to link the developer’s “equity” to a profit share of the product/service being developed. You can give away equity in your business if it is a company limited by shares, by issuing the developer with shares in consideration for providing services. But this can be complex. You need to consider things like what rights are to be attached to the shares issued to the developer. You should also put a shareholders’ agreement and new articles in place, to set out what will happen if the business doesn’t perform. It’s a complicated area and you’d also need separate tax advice. 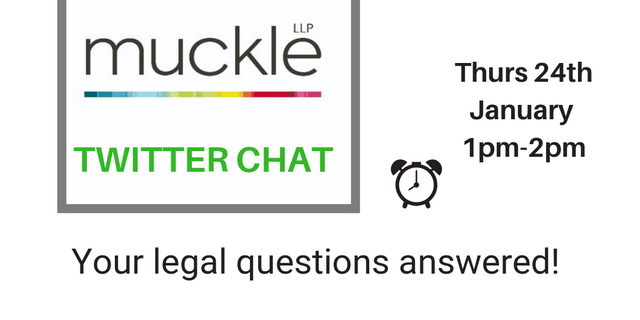 Muckle would be happy to have an initial chat about this free of charge - just email advice@muckle-llp.com and they can pick it up from there. A big thank you to Jill and the team at Muckle LLP for giving up their lunch break to chat to us about startup legals. It was a fantastic hour, sharing insights that can support and advise the SME community in the North East. We love working with Muckle LLP, as a local firm with specialists in pretty much every area, the team are always more than happy to advise and support! If you’d like more information about the services offered please visit their website. If you’d like to read more from Muckle LLP check out some of their guest blogs. Don't forget to keep an eye out on our social media pages for the next #SSCAsktheExpert. There are different ways this can be done and it doesn’t have to lead to a huge legal bill.